/ What Is The Best Filter For A Planted Tank? In this article we will look at some of the best filters for a freshwater planted aquarium. Filtration is key to maintain any aquarium’s health and appearance. Planted tanks often require specific lighting and water conditions for the resident plants to thrive. Proper filtration is key in creating and maintaining these water conditions. Many systems allow the addition of various media to assist in the manipulation of water characteristics such as hardness that are necessary for your plants’ survival. Some Of The Best Filters For A Planted Tank ﻿1. Fluval C4 Power Filter 2. Eheim Classic Canister Filter ﻿3. AquaClear Power Filter 4. 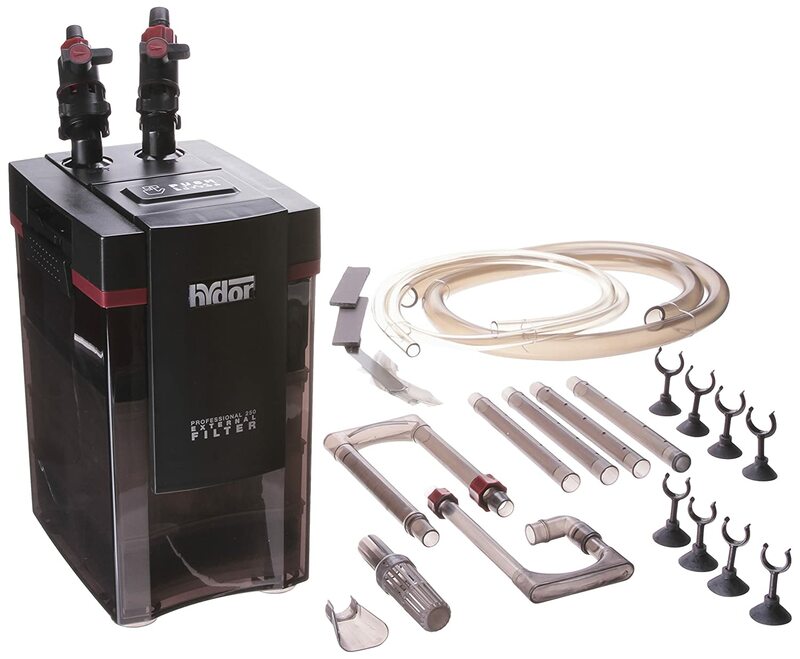 Hydor Professional External Canister Filter 5. Penn Plax Cascade Canister Aquarium Filter ﻿What Is The Best Filter For Your Planted Tank? Why Use Filtration For Your Planted Tank? Most aquariums benefit from the use of a filtration system. Though there are some aquarists who go completely low tech and attempt to maintain a planted aquarium without filtration, this is not the norm. The majority of us use filters to keep the water circulating in our tanks and to keep them clean and healthy for the plants and animals we choose to keep. Aquatic plants derive many of their nutrients through their contact with the water and even a gently flowing circulation will improve the plants’ ability to extract these vital substances. A filtration system adequate for your size tank will provide this water circulation. While water circulation can also be obtained without filtration by use of a powerhead to simply move the water around, your fish will benefit from good mechanical and biological filtration. The plants themselves perform biological filtration and at some point in a heavily planted tank may eliminate the need for additional filtration of this kind. Mechanical filtration which removes particles from the water to keep it clear can not be neglected. In a closed system such as an aquarium mechanical filtration is vital to the system’s long term viability. Since the aquatic plants in your tank rely on water movement, an aquarium filled with stagnant, stationary water will not do your plants or fish any good. That being said, you also do not want an extremely vigorous water circulation. Filters come rated for a specific size aquarium usually based on a gallon per hour (GPH) number. This indicates the number of gallons of water your filter will move in an hour. In general for a planted aquarium you should start with a filter that can move 7 to10 times the amount of water in your tank. I currently have a 10 gallon planted aquarium with a filter rated at 75 gallons per hour and it moves the water quite nicely. You do not want to overdo the flow rate as you want your plants to at most be gently swaying in the water, not pinned down beneath a strong flow. This will allow optimal nutrient absorption by your plants and will also allow your fish to find peaceful areas of the tank where they do not have to fight the current to remain stationary and rest. The amount of water moved is not the only factor to look at when considering circulation. The direction of the flow is important in distributing the nutrients and CO2 that your plants need. The best way to achieve this is with a flow coming from the back of the aquarium. The water should flow from the rear to the front of the tank without breaking the surface of the water. It will then flow down the front of the tank to the substrate and then return to the filtration system by moving across the bottom of the tank. This creates a front to back circular motion of your tank’s water. The flowing water will in this way contact all your plants and keep them nutritionally satisfied. Chemical filtration needs to be addressed with some caution in a planted tank. Carbon, which is a standard in many filtrations systems, can adversely affect your plants. Filters that allow the addition of buffers that adjust water hardness to levels compatible with your plants can be beneficial when used correctly. Filters are available in a variety of configurations for your aquarium. All of these filters require maintenance to keep them in good working condition. Some filters have reusable filter pads and sponges that can be cleaned and used many times. Other filters use cartridges that are disposable and require replacement every time you clean your filter. There are pros and cons to each type of filter and it is often a matter of personal choice as to the filter you will purchase. As we will see, some types of filters will definitely work better in a planted tank than others. The two main types of filters suitable for your planted tank are canister filters and hang on the back (HOB) filters. They both have some advantages and disadvantages as we will discuss below. Canister filters are very efficient in maintaining your aquarium and offer flexibility when considering filter media or buffers to change or maintain your water chemistry. On the positive side canister filters require maintenance less often and usually allow control of the water return through a spray bar attachment. Keeping this spray bar underwater is the best way to use it and it can create excellent water circulation throughout your aquarium to the benefit of all plants and fish. A canister filter will usually be located below your tank with only room for hoses needed behind the tank which allows you to place your aquarium closer to a wall. In most cases they have reusable filter media reducing the need to purchase replacements. Though requiring maintenance less often, canister filters are more complicated to clean and restart than an HOB filter. These filters are available for larger size aquariums so that can be a determining factor when choosing your filter. Canisters are not recommended for small aquariums. Canister filters are also more expensive than HOB filters. HOB filters are a great choice for aquariums of up to 55 gallons if you plan on using just one filter. They can be used in larger aquariums if multiple units are employed. HOBs are generally less expensive than canister filters and can be obtained in sizes that work for very small tanks. Maintenance is simpler with an HOB filter but the media often is comprised of disposable filter cartridges which will add to the expense of maintaining your filter. They are easy to set up but do need some space to fit behind your tank. HOB filters are less flexible in directing the return water flow from the filter though some of the newer models do have a flow control to allow some variation in flow rate. Some HOB filters can be a little noisy. Undergravel filters are not really appropriate for a planted aquarium. The plants roots can get tangled in the grates and hinder the filter flow. Cleaning an undergravel filter also entails taking your tank apart. This is not something that an aquarist who has worked hard to achieve a nicely planted aquarium will want to deal with. Here are some of the best filters you can purchase for your freshwater planted tank. 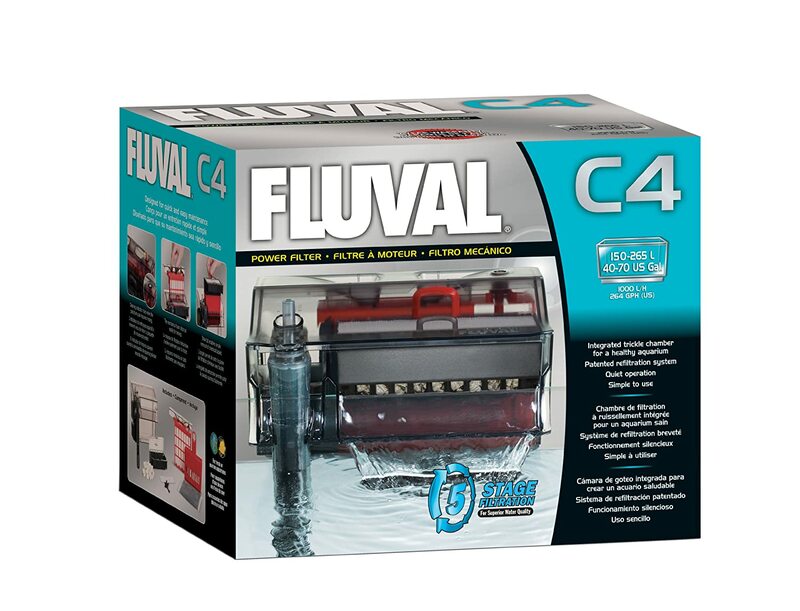 The Fluval C4 Power Filter is an HOB filter that will work well on planted tanks up to 50 gallons in size. It provides extensive mechanical, biological and chemical filtration through a 5 step process that leads to clear and healthy aquarium water. A feature of this filter that is especially important for a planted aquarium is that it uses a patented refiltration system that allows you to control the water output. You can slow it down to protect delicate plants and fish and allow the plants optimal nutrient absorption. Maintenance can be performed in stages due to its modular design, allowing you to replace or clean only one type of media at a time. This filter combines some of the best features of a canister filter with the ease of use of an HOB. It is designed to allow customization of the filter media if so desired, to say replace carbon with another biological filtration pad, or hardness buffers to protect your plants. It includes a telescoping intake tube to allow water to be drawn from whatever depth you desire. A nice choice in an HOB filter. Eheim has been making canister filters for a long time. The Eheim Classic is available in various sizes to suit many aquariums, and allows for a canister to be used in a fairly small setting. It provides the benefits of a canister filter mentioned above and comes with a spray bar, eliminating the need for extra accessories. It is very quiet and energy efficient. The Classic can be used with filter pads or filled with loose filter media of your choosing. 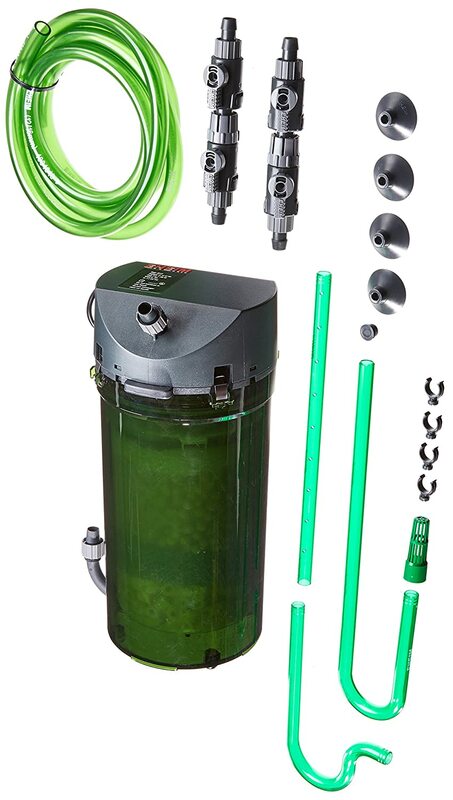 Some users found it to be difficult to prime but in all other aspects it is a great choice for a canister filter and will do the job of maintaining your planted aquarium. The AquaClear Power Filter is available in different sizes that are excellent for planted aquariums up to 55 gallons. Its multi-stage filtration system provides complete mechanical, biological and chemical filtration. It runs quietly which is a big factor when looking at HOB filters. AquaClear uses a unique waterfall system that gently and silently returns the filtered water to your aquarium. As with the Fluval C4, this filter gives you some flow control often only found in a canister filter and enables you to slow down the water flow rate to protect your plants. It is easy to set up and its media baskets make for easy maintenance. This filter features a large filtration volume that produces extended contact time between filter media and water. You can use additional media to perform custom chemical filtration by adding your own bulk materials to the media baskets. The AquaClear Power filter will serve you well in your quest to keep your planted tank looking great. The Hydor Professional External Canister Filter is another fine choice for your planted tank. It comes complete with a spray bar to control water flow and is available for use in aquariums up to 150 gallons. It is easy to use and set up featuring an easy priming mechanism. The filter is manufactured to run silently with little vibration and allows for various combinations of filter media. It is a little more expensive than some other canister filters but its exceptional quality offsets that expense. The square design makes it a space saver as well. An excellent choice in a canister filter for your tank. The Cascade filter by Penn Plax is a very economical choice in a canister filter. 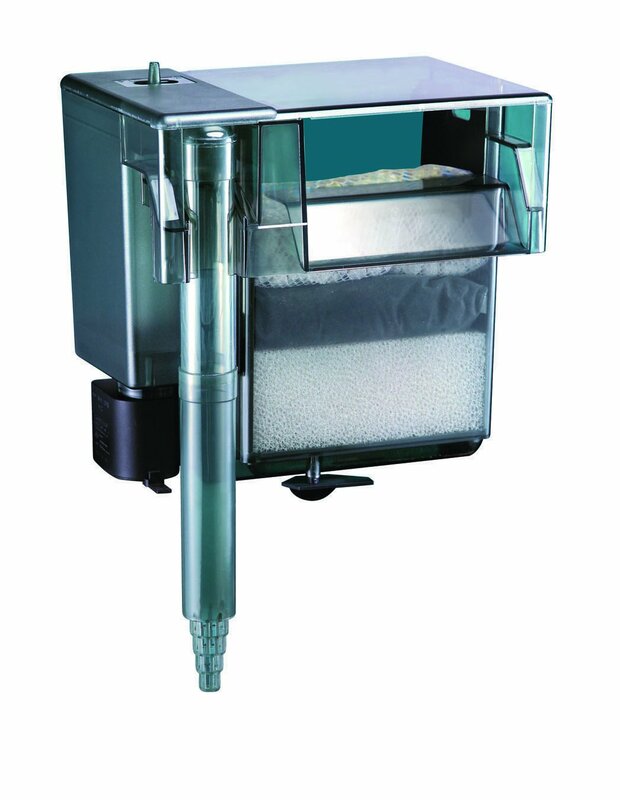 Its available models offer very effective filtration for both small and large tanks. The filter has a simple push button priming mechanism to eliminate problems when restarting the unit. This filter is easy to install and will take about 30 minutes to get up and running. Large media baskets extend the time between required maintenance and let you use the filter media of your choice. Sturdily constructed and quiet to operate, the Cascade filter is ideal for those wanting to check out a canister filter but reluctant to spend a lot of money. What Is The Best Filter For Your Planted Tank? All of these filters will do a good job of maintaining the health and appearance of your planted aquarium. As for all filters, be sure to purchase the proper size. Even the best filter will not work on a tank larger than it is designed to handle. There are both power HOB filters and canister filters available for most size tanks and you can always use more than one for a very large aquarium. Though you cannot go wrong with any of these filters, I would recommend the Fluval C4 Power Filter as the best filter for your planted aquarium. Its winning combination of canister filter properties and HOB ease of use brings this filter to the top of my list. Whichever filter you choose I wish you great success in your endeavor to create a planted aquarium that you will be proud to display.